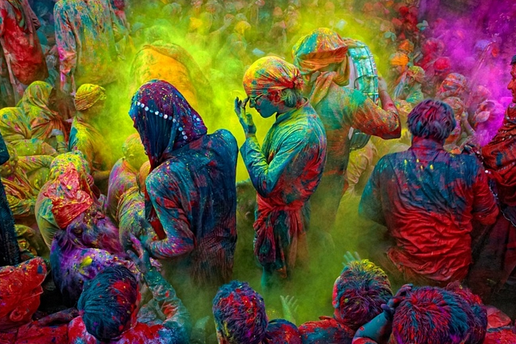 India’s annual Holi festival is an ancient Hindu religious festival celebrating colour, joy and love. Adults and children dart about; laughing, chasing and covering each other with paint. Handfuls of paint powder in rich rusty red, neon pink, or brilliant blue are strewn through the air, or mixed with water and squirted cheekily through water pistols. Everyone is fair game, and small explosions of colour and giggles burst through the streets. The celebrations continue with sticky sweets, crisp pastry treats and savoury rice. Holi is an example of India at its most authentic; colourful, chaotic and playful. In the Caribbean, the pastel-tinted walls of Havana’s colonial old town tell a visual story of Cuba’s fascinating mix of decadence and decay. The city was built in the baroque and neo-classical style, however, some buildings have since fallen into ruin. The pretty shades of the plaster falling away from walls reveal contrasting colours underneath, unintentionally adding to the cheerful feel of the tree-lined courtyards and alleyways. Another somewhat surprising pleasure in Havana is the opportunity to see hundreds of bright, chrome-covered, classic American cars. Up until the Revolution in 1960, Cuba was the largest importer of American cars, and for years (and in the face of the economic embargo preventing newer cars from being imported) these vintage cars have been lovingly maintained. If you’re adventurous enough to dip below the surface, a riot of colour and iridescence exists in the underwater domain. The Solomon Islands boast year round world-class diving, with reefs rich in cultural and biological diversity. The walls, pinnacles and coral gardens of the Solomon Islands support an amazing variety and quantity of sea creatures. Vivid anemone fish, angel fish, butterfly fish, and hump-head parrot fish can be seen hiding in the reefs, whilst just a short distance away, schools of barracuda cruise the translucent turquoise waters. Most of the archipelago’s 992 islands are surrounded by coral reefs with tranquil blue lagoons and sun-soaked white sand beaches, lined with lush coconut palms to tempt you back out of the water. If you would like to experience a colourful, authentic and uniquely crafted adventure, do contact us here.